Vadai is a popular snack or breakfast dish which is usually served with coconut chutney and sambar. You can have it with tomato sauce also. In this recipe, I have soaked 1/2 tsp raw rice and 1/2 tsp fried gram (pottukadalai) along with urad dal for crispy vadas. My mother does awesome vadas and it is her recipe. Vada is delicious as such and even when soaked in sambar or rasam or curd. Let us learn how to make medhu vadai/ulundu Vadai (South Indian Style) following this easy recipe. Soak urad dal along with 1/2 tsp rice and 1/2 tsp fried gram for half an hour and refrigerate it for another 1 hour. Heat oil in a deep bottomed kadai. Once the oil is heated, reduce the flame to medium. To check if the oil is hot, drop a little batter, if it comes to the surface immediately, the oil is hot enough to fry the vadas. Fry until it turns golden brown on both sides. Remove it from oil and place it on a colander or paper towel to drain excess oil. Repeat the same process for the rest of the dough. You can fry 3-4 vadas at a time depending on the size of your kadai and the quantity of oil used. Enjoy vadas with sambar, chutney or tomato sauce any time. As soon as your remove the vada from oil, soak it in rasam for rasa vada. Grind green chillies and ginger to a fine paste and mix it with thick curd. Add salt needed, coriander powder and cumin seed powder to the curd. Keep a bowl of warm water. As soon as your remove the vada from oil, soak it for a few seconds in water, squeeze out the water and then soak it in the prepared curd. Let it remain soaked for 10-15 minutes. Garnish with coriander leaves and enjoy delicious South Indian thayir vadai. You can also garnish it with Kara boondi. Check out my Punjabi Dahi Vada also. 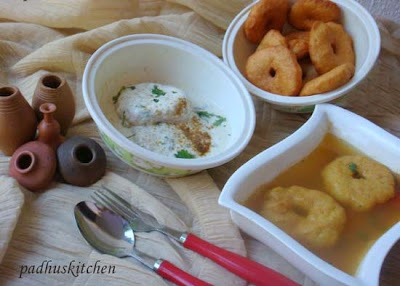 wow..lovely clicks dear.....vadda, sambar vada, dahi vada verything looks yummm.....perfect for the event. keep rocking. Yummy vadas.....my family's fav snack. Nice clicks. Nice click!! and nice tip for crispy vadas..!! ohh yummy vada..love all the recipes with vada. Wow. love them all. Beautiful Clicks.Look crispy and inviting. IN fact ur Dahi Vada I'll eat right now and Vada Sambhar tomorrow morning. OMG Now I'm craving for them rt now !!! 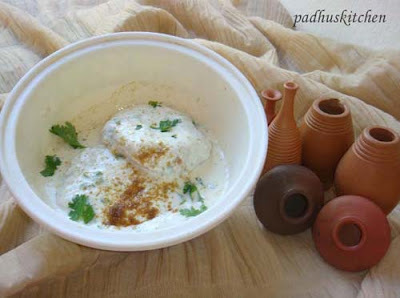 looks so delicious ...i love dahi vada..
One of my favorite vadas,to have them as is, with sambhar and as dahi vada. Looks god. Yummy vadas. Adding pottukadalai is new to me, would add the next time and enjoy crispy vadas like yours. Rasam vada and curd vada looks absolutely tempting. Thanks for stopping by my blog dear; you have a great space here with very delicious recipes and nice clicks! I'll be sure to visit again. Nice presentation! I like vadas with chutney so much. great tips. nice recipe and great clicks. your presentations are really good Padhu. love the vada sambar more thna others. sambar vada is my fav while curd vada is my Dh's..thanks for posting both recipes in a single post. I love your presentation...the earthen pots look so lovely!! Medhu vada mela looks fantastic! Perfect for my evening snacks! Thanks for the wishes Padhu!Wish you a Happy XMAS and a very Happy New Year with lots of fun and happiness!!! 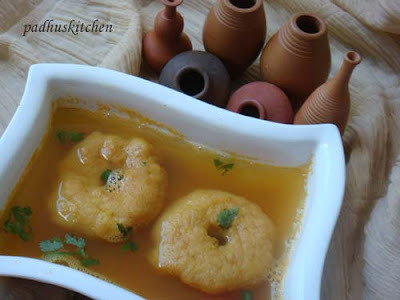 I can have them in this cold weather here:)I can never get a hole in my vadas..
oh this looks delicious! beautiful photos! Vada looks yummy. Sure I will try your recipe. Thanks keep posting recipes. I dont have skinned urad dhal in stock at home. If I am to use whole urad dhal, could you please let me know the ratio of the ingredients? i tried out the recipe. It was yummy and crispy. I added a spoon of ginger paste and that helped too. But may i know what is the reason behind refrigerating soaked Urad dal? Thanks for the medhu vada recipe. Tried it today but I used the mixie instead of the wet grinder and split urad instead of whole and didn't add water while grinding. I also used greased aluminium foil but i couldn't make the vada with the hole as the shape was not retained when I tried to transfer it from the foil to my palm, can you please tell me the reason why this happened. So I ended up just dropping the dough with a spoon into the oil. The vadas were crisp outside but slightly hard inside, can you please tell me the reason why this happened? So I added a pinch of cooking soda to the batter and then dropped them in oil, this turned out fine crisp outside and soft inside but not like the ones we find in restaurants. I am desperately trying to perfect this recipe as everybody in my family loves it. Appreciate your help. Awaiting an early response. Ranjitha -You can use mixie -that is not a problem. You should use whole urad dal without skin as the batter will be very fluffy and you will get crispy vadas. Also you can add rice and fried gram while soaking urad dal. Thanks for the recipe. Any tips for making the vadas more crispy? Rajeshwari - Adding raw rice and fried gram is to make the vadas crispy. Kindly read the first paragraph. I have done this several times, not even once it bursted for me. This recipe has been tried and tested by many readers with success. You have to refrigerate the whole urad dal and not the batter. Keeping it in the refrigerator is optional.There is nothing wrong in my method. Maybe while transferring the batter from your hands to the hot oil, you might have dropped it along with a little water accidentally. Loved ur recipe padhu. Adding pottukadalai is new to me. Can I add black pepper and jeera as done in temples, to this recipe? Thank you Anu for liking my recipes.Yes, you can add pepper and jeera if you like the flavor. Been an ardent follower of your blog. This recipe however did not work for me. Couldn't get the vada shape with my batter and they weren't crispy. Tasted good though. I think the problem might have been with the proportion of urad dal. By one cup, did you mean the actual measure of a cup or a general cup sized vessel's measurement? Thank for being an ardent follower of my blog. Actually we make this vada frequently for festivals. I presume that the problem is with your grinding. The batter should be light and fluffy. You should not add too much water, then you will not get the vada shape.That is the reason for your vada not being crispy. As far as possible try to grind without adding water, if required just sprinkle once or twice. I use only my standard My measuring cups and spoons for all my recipes. Your problem is not with the measurements. Thank you for posting this. Tried this recipe and the vadas came put well. Soft inside and crispy outside. One question though - the outer layer was very slightly thick. What should I do next time to prevent this? Nice to know that the vada came out well. Regarding your question - It depends on grinding the batter, quality of urad dal and also you should take very less batter and flatten it for making vadas. Tried it out yesterday following the recipe and instructions. Ground it in mixie (i dont have a grinder) without water but the problem was the batter was highly sticky to the hand and couldn't remove it from the sheet as well. So couldn't succeed in trasnfering to the oil and get the vada fried. to solve the problem.Thanks . Rama - If the batter is sticky, you must sprinkle water and grind for some more time. Correct consistency is - when you dip your hands in water and take a ball of batter, it should not stick.Probably u did not grind it properly. Also while making vadas- you should dip your fingers in water every time when u take a ball of batter. Being a novice after some months of hesitation,tried it out yesterday,Followed all the recipe guidelines meticulously,ground the dal to fluffy paste without a single drop of water,did the wet hand non stick padham test,dipped hands in water,took and flattened the batter on polythene sheet and then tried to drop it in oil.But alas it was gettting struck to the hands and refused to leave the sheet. Tried it again and again but in vain. Finally made vada balls and ate it. Pl guide me where I could have gone wrong as I am keen to perfect this receipe for my kids. Many of your other recipes have been tried by me and were instant success in first attempt itself. I have already replied to your question. You have asked the same question earlier. Sprinkle little water and grind for some more time if the vada batter sticks. Hi Padhu. Tried your medhu vada receipe. Was tasty crispy and soft inside. Every one in my family loved it. I'm a real fan of your blog... I started following it last year when I started cooking by myself. Tried so many dishes and everything turned out really great! - - Lots of love, newbie cook. Unga recipe simple and fast. I used a mixie and was able to knock it out in less than an hour and a half with all the oora vechifying and arachufying. Diwali concluded on a really nice note , away from home. Hi tried making the vada yesterday but it burst out of oil. I soaked dal and rice for an hour(lack of time), dint refrigerate and grinded it in mixie. Dint add pottu kadalai either. Added ginger green chilli and curry leaves while grinding. What could be the mistake? Either you have have added too much water or may be you used rock salt and did not grind it properly.This is totally new to me. I have not heard of vada bursting in oil. Vada will never burst. May be your hands must have been wet. hi, some times vada could burst out. i've seen this when my mom tried once. the reason behind this is not about choosing mixie or grinder, it is about the quality of the urad dhal we buy. a best quality of urad dhal will never burst. Vada bursting is very common. Reasons are varied. No fault of yours. Or the daal's. It happened to me two days ago. With the same urad daal I had prepared perfect vadas the previous weekend. Now, I was googling for reasons of vada bursting, and found many. Could be because of more water, too hot oil, due to rice flour, and so on. Thanks for this wonderful receipe . I did try this . it was awesome. I was initially very hesitant to try , bcos I was in an idea that only experts can do vada .. but u gave me the confidence .. and broke away all the elderly ideas thru u r blog and thru u r correct instructions . God bless u and u r family for helping so many individuals like me. ... now coming to the vada , I dont have a grinder here in states . so I used the miXie and as per u r instructions I added very little water and tried with little urad dal . and it was awesome. I myself was all in praises for u and (lol ) me.. but next time being over greedy I wanted to have more vadai and used higher quantity of urad dal .. and by mistake have added more water also unknowingly. Now I m not getting vadas at all.. only oil drenched urad balls are available. I don't feel like throwing the flour . I have brought the dal from India with much difficulty. Can u suggest any idea so that I can make use of the ground urad dal to some useful receipe. Leave out vada any other eatable recipe would do . Pls do help . Vevel - Thank you for your nice words.As it is only urad dal batter, you can mix a little ragi flour or kambu flour and make dosas. I have not tried it but I think it will work out. Add water if required and mix well to get dosa batter consistency and make dosas. First try with little batter. If it comes out well, you can add flour to the rest of the batter and make dosas. If it turns out well, do leave your feedback. Sure thank u. . ll definitely try..
You can refrigerate the batter. But bring it to room temperature before making vadas. Also in this way the vadas will drink a little oil. Padhu I tried the vadai and it was good, thank you! But it was a little dense and not light. I refrigerated the dal for 2 hours instead of 1. Could that be the reason or can you please tell me the possible mistakes I might have made? If the medhu vada was a little dense, it might be due to the consistency of the batter. The batter should be light and fluffy. It should not be too thick. You can mix the batter well with your hands to incorporate air into the batter. i soaked the dal and could not prepare the same day hence kept in fridge and second day i made vada. it absorbed quite a good amount of oil. what is the reason and where i went wrong. normally, i soak it for 30-60 mts and grind it and make it immediately. Yes it will if you keep it in the fridge and make it the next day. For the medhu vada to be soft, you have to grind it well. It should be soft and fluffy. It is best to use wet grinder for grinding for vada. You should not add water but can dip your hands in water and sprinkle lightly. some one had posted it was bursting. Once it happened to me as there was whole urad dal in it. it was a disaster for me.It never happened in my life like this since then i am very careful while grinding. Can i soak urad dhal overnight? Does that affect the taste or the consistency required for the vada? Soaking for just 1 -2 hours is more than sufficient. Soaking overnight is not required as it will absorb too much oil. Tried this yesterday and It came out really well.